Testing out the Z-1 prototype (Credits: NASA). NASA’s Johnson Space Center’s Advanced Exploration Systems team are in the midst of developing new spacesuits that can be used by future astronauts to explore extraterrestrials bodies such as Mars, the Moon, or asteroids. The Z-1 prototype goes one step further: it can can replace not only existing spacesuits but airlocks as well. The Z-1 is donned via a rear entry hatch that is sealed with a backpack-like life support pack. When the pack is not attached, the hatch can be docked directly to a rover or spacecraft. 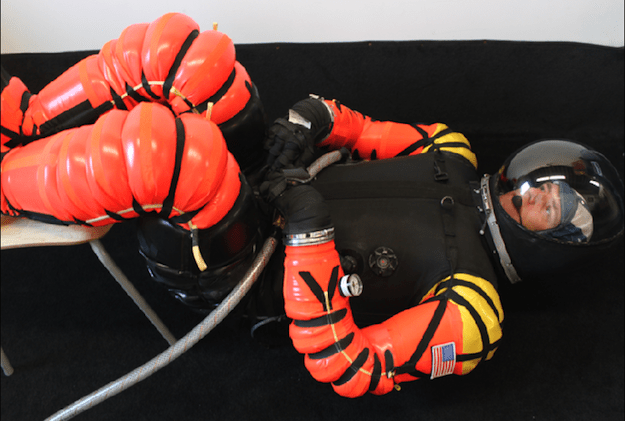 The suit is designed to work at cabin pressure, enabling astronauts to shorten their pre-breath preparation – potentially hours of time when astronauts are usually stuck in a suit adjusting to the gas composition and pressure they will need to rely on while on extravehicular activity (EVA). The prebreath prevents decompression sickness, whose most common symptom, “the bends,” occurs when bubbles of nitrogen rise out of a person’s blood supply, gathering at their joints and causing potentially severe pain. Not only does the suitport, as its being called, shorten lengthy and tedious preparations, it can potentially prevent the loss of valuable breathable air supply that is normally vented from the airlock along with the exiting astronaut. 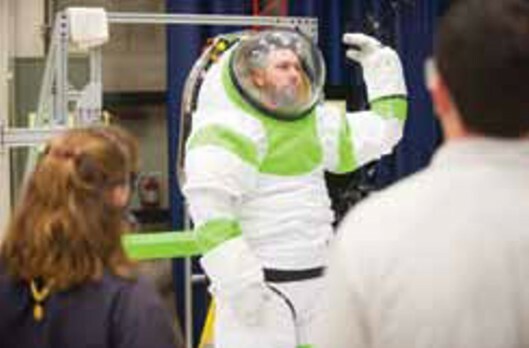 Final Frontier Design’s intravehicular spacesuit prototype (Credits: FFD). When it comes to designing spacesuits, the sky is no limit.